It’s an angry, awkward moment. Panel 3 might also contain one of the single greatest exaggerated facial expressions I’ve ever drawn. 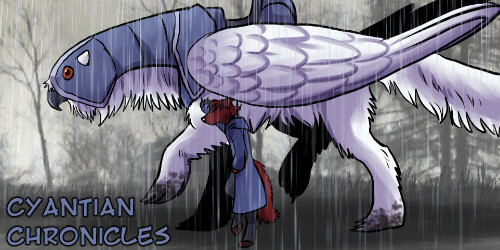 And hey, how about some interesting and new comics to read this weekend? The Cyantian Chronicles: An adventure in finding yourself and living with it. The Cyantians are a race of uplifted creatures, created to serve a dying alien race. Abandoned on a world not their own, they’re learning to make it home. 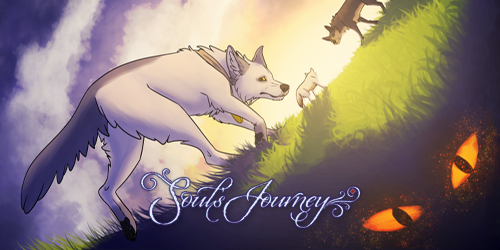 Soul’s Journey – A cursed pendant turns a runaway prince into a wolf. Can he find a way back to his human form to stop the brewing war on the horizon before it’s too late? 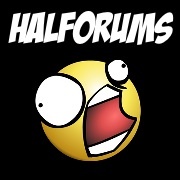 You can leave comments by clicking here, leave a trackback at http://supervillainous.spiderforest.com/comic/last-to-know/trackback/ or subscibe to the RSS Comments Feed for this post. 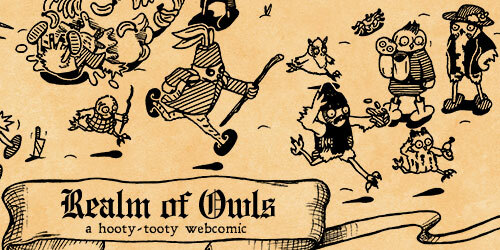 The link to the owl comic leads to a 404. Oh chin up Claw. At least you’re not as clueless as Lex Luther about his nemesis. Lex even cloned him and didn’t think to use the DNA to track Supes down. You only see Mark a couple times a year while Lex sees Clark at least a couple times a week. And don’t get me started with that Louis Lane chick. She literally falls for the guy and never knows she has been working with him for years. Lex Luthor’s considered the idea that Clark Kent is Superman, but refuses to accept it because the idea is so antithetical to his own worldview and philosophy. Louis Lane… has no excuse, and should feel bad. DCAU had Clark explain how he beat her to a bi-line or however that is spelled. And Lois brushed it off as ridiculous. As Lex’s view of Superman says he can’t be as lowly as Clark. Lois’ opinion of Clark says he can’t be as great as Superman. Byline, as in this article written by (reporter’s name). That would be surprising: to be immune to all known forms of physical danger, but then to literally die (of) laughing. OMG! What a shocker! WOW! The big reveal! Ultimo better run now that the Claw has discovered his most important secret. I guess the glasses won’t work. So he should wear a false beard and moustache from now on, and maybe an eye patch. Just remember to always cover the same eye with it. The Claw is a keen observer and will surely notice if the thing keeps switching back and forth. What a plot twist! Mark is Ultimo! Nothing is gonna be the same after this! How did you ever dream this one up? Golly, I never suspected …. Has Claw ever even met Mark as just Mark before? Claw’s words in the first panel would seem to imply it. As does “All this time I’ve known you. All these years!” in the second. 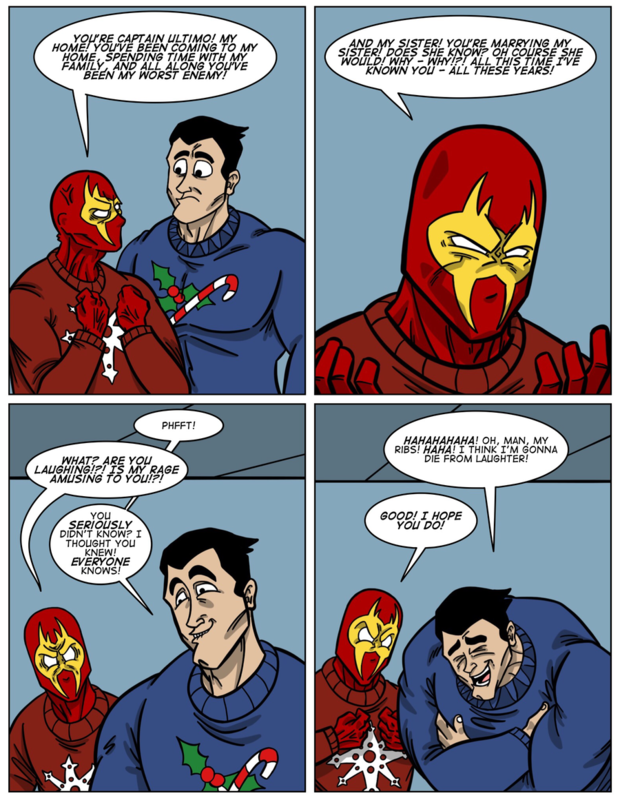 Copyright © http://supervillainous.spiderforest.com 2019 - 2019 all rights reserved.